It started in the bathroom fan of a unit on the third floor. It smoldered in the attic for a while, then spread quickly as there were no firewalls in the attic. When the alarm went off, I didn’t think much about it, as we had been having trouble with the alarms. But when it continued to screech, I went into the hallway and smelled smoke. Still disbelieving, I set my laptop on the table next to my chair, put on my coat and boots, grabbed my purse, and went outside. I thought that perhaps someone had left a pan on the stove. Reality struck when I saw flames shooting through the roof, and many, many firetrucks. Thanks to live TV coverage, my phone was blowing up with calls from concerned friends. By now, it was three weeks after the fire. As everything was on the computer, I had no way of immediately contacting clients to let them know the situation. Because I had not been in touch, several moved on to other writers. And when I did finally reach them, it was too late. 2. Have a trustworthy insurance agent. 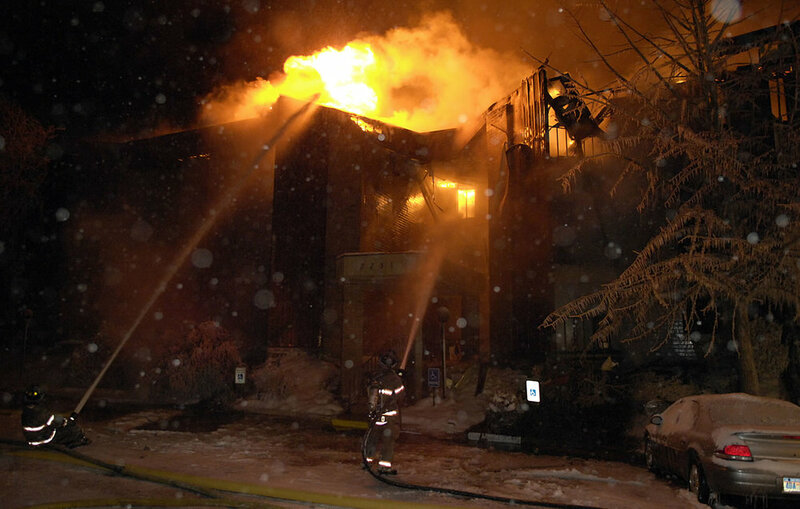 I had never met nor spoken to my insurance agent prior to the fire. When I finally reached him, he cut me a check for $1,000 and then disappeared for six weeks to New Orleans to deal with Katrina claims. 3. Insure your business equipment. Yes, I had renter’s insurance (I was renting the condo) and the $1,000 check was supposed to be enough to buy me a new computer. What it didn’t cover was the $700 charge to recover the data from the frozen drive. Or a new printer. Or modem. Or any of the other pieces of equipment we needed ten years ago. 4. Sync everything. Back-up everything. 5. Have a network of fellow creatives who can help you get back up and running by loaning you equipment, offering a workspace, or even take over a project if it comes to that. Don’t let a relatively simple (compared to hurricanes and mudslides) disaster shut down your business.